Exclusive First Listen: Dirty Projectors In what's already an unusually strong year for music, Dirty Projectors' Bitte Orca still stands out as one of 2009's most unusual and refreshingly unpredictable records. Hear the album in its idiosyncratic entirety. Audio for this feature is no longer available. The album was released on June 9, 2009. It's been an unusually strong year for music, and we're not even halfway through it. New albums from Animal Collective, The Decemberists, M. Ward, Danger Mouse and Sparklehorse, and many other artists have already made 2009 an extraordinarily memorable year. In such a crowded field of talent, Bitte Orca — the new album from Dirty Projectors — still stands out as one of the year's most unusual and refreshingly unpredictable records. Listen to the entire album for a week before its release, as part of our Exclusive First Listen series. Bitte Orca is the fifth full-length studio album from Dirty Projectors, and while it takes a lot of unexpected turns into surreal sonic territory, it's probably the band's most accessible work so far. It's also its most fully realized, mixing strange and unpredictable song structures with moments of bracing beauty. Far from conventional pop music, Bitte Orca has nevertheless spawned the sort of pre-release buzz reserved for budding stars. The members of Dirty Projectors have a well-earned reputation for dismantling standard melodic forms and chord structures and rearranging the elements until they no longer resemble the kinds of songs most people are used to hearing. The result is idiosyncratic and complex, but it's also the sort of musical thrill ride that some listeners won't enjoy. Still, love it or hate it, it's hard not to be impressed with what Dirty Projectors' members have accomplished. Bitte Orca is awe-inspiringly executed and marked by sparkling imagination. 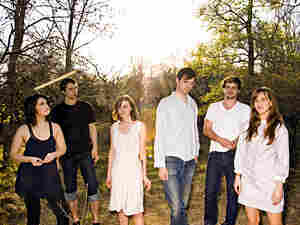 Dave Longstreth formed Dirty Projectors in 2002, and the group now also counts Angel Deradoorian, Amber Coffman and Brian McComber as principal members.